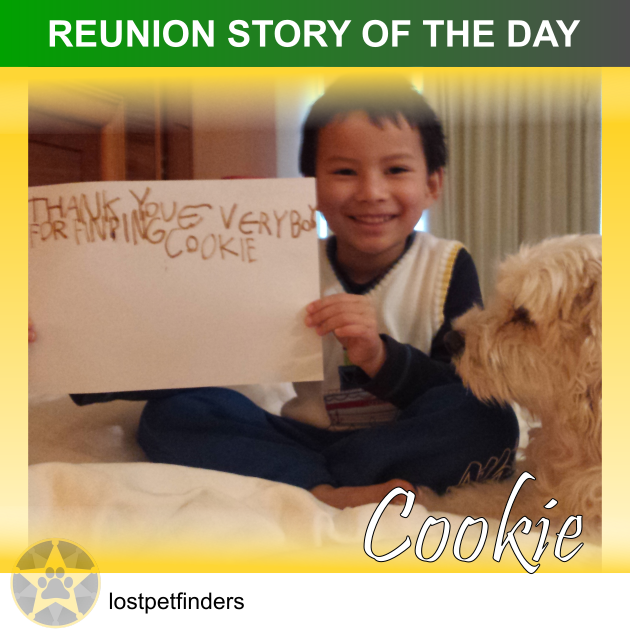 "We want to thank you for helping to reunite us with our beloved Cookie. The Brimbank Veterinary Clinic contacted us after seeing our Pet Alert to inform us that a good samaritan had dropped Cookie at their place very shortly after he went missing from our house. We are so thankful to everybody involved. Here are a few pictures of our reunited family! "Thank you so much for the support you give to us. I am really grateful and feel luck that Tony came back. 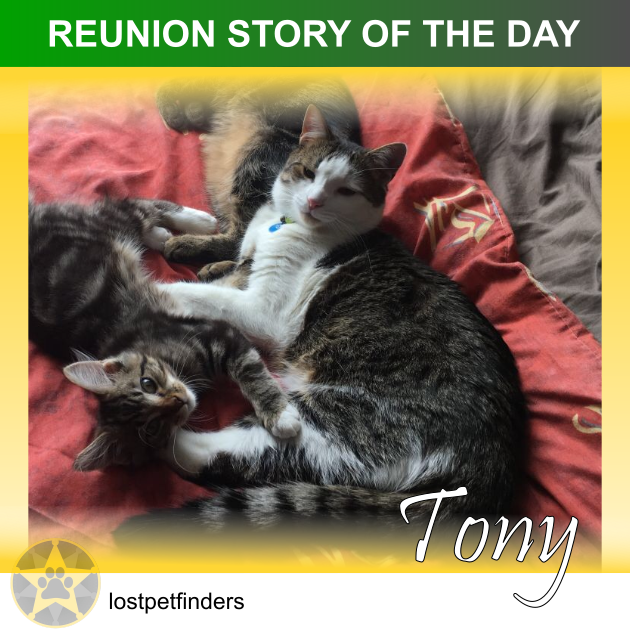 I would like to share the story Tony's return. I really hope that other people who lost their cats can learn from our experience. The last time we saw Tony before his missing is around 3:00pm, Saturday afternoon, the 6th May. We have 3 cats, and they are all indoor cats. Tony and Jethro are only turned 1 year old. Alex is still a baby. We occasionally let Tony and Jethero out for half day on weekends when my husband works in the backyard. Normally, they will want to go back inside the house after a couple of hours. But last Saturday, we saw Tony walking on the fence towards front yard around 3:00pm, then never seeing them again. We started to call them when sun started to go down, but with no luck. So we searched neighbour area, call their names, but they never came back. We did the search and calling around 9:30 pm, then 11:00pm, no result. We put the cats sleeping bed out in front door, and food bowls out side back door. It was about midnight, my husband went out for last try, he heard a very faint bell in our neighbour's front yard, he went to call the cats name, Jethero came out, tried to sniff his hand but startled by some noise and ran away again. He quickly came back and get Jethro's food bowl with some food. When the second time he went to call Jethro with the food, the cat came to him and sniffed him, so huby scooped him up, brought him back. But Tony still was nowhere to be seen. Jethero is a timid cat, he is easy to be scared and always hides. On the contrary, Tony is always buoyant, adventurous, brave, and always seems to be able to protect himself. He probably just wants to wonder around a bit. So we thought he could be alright over on night. He would come back Sunday morning. However, by 10:00am Sunday morning , there was still no sign of Tony, I felt really heavy in my heart. In the end, Tony is an indoor cat, he never wondered out of our property. He is not experienced, if something had scared him, fear would get the best of him and driven him away from home, he could be disoriented. So we started the search again. We spent all day walking about the area and streets, calling Tony's name, knocking on neighbours' doors. We did that about every 1~2 hours but without luck. By 12:00 pm midnight, I was exhausted and lost hope. I couldn't sleep. I went out around 1:00am, couldn't call out, so I used his food bowl making knocking sound and make noises with my mouth as well. I believe that I stirred up all the cats in our neighbourhood. I even got another cat came out talked to me for a couple of minutes. By then, I believed that Tony wasn't nearby and totally lost. I remembered that I read on internet that somebody suggested to search lost pet at around 3:00~4:00am, the quietest time, so the lost pet can hear your voice better. As the last effort, I went out at around 4:00am, knocking the food bowl and called his name quietly at every inter section in our area and waited a couple of minutes. When Tony didn't turn up, I gave up and went back home around 5:00am. 6:00am Monday morning, we got up to prepare for my daughter for school; and I opened the back screen door (timber door never closed over the past 2 nights just in case he came back, scratching and we cannot hear him) had a last look without any hope in my mind. Its like a miracle, I heard this weak and faint meow on the side of the house, I shout out: 'Tony!'. Hear he was, timid and hesitated he looked up to me and started to wobbly move towards the door. I scooped him up. He lost a lot of weight in just 2 days. he looked nervous, exhausted and scared. His front paws' skin were ripped off, though the nails seemed intact. I think he must run a long way home. Or probably not far but had to zigzaged a long way to find home. It must be the last round calling at 4:00am worked the miracle. The faint sound and faint hope brought him home. What I want to say to the fellow owners who lost their pets is that never give up hope. Always try at night or really early morning to search for them. As long as they can hear you, they will come back. They can hear a long way. You need to let them know where is the lighthouse and guide them to come back home. "Prince is like another child to me. We have only been together for 10 months, but he quickly claimed me as his 'mum', and our family have nurtured him from when we first got him at 7 months old. He is a very gentle and special dog, however, is wary of people as it appears that he has suffered some trauma prior to being welcomed into our family. He went missing in unusual circumstances as I was in a suburb that we were not familiar with (an hour's drive from our home), as I was visiting a friend that day. When I realised he had gone missing I felt sick with anxiety. I went searching in my car within 10 mins of him being gone, and my friend assisted. We saw him running down a busy road towards another very busy main road, and managed to corner him and he then panicked and ran across the road to the other side and vanished. We spend until dusk that day searching by car around all the surrounding streets, parks and local bushland and went door knocking to try to find him. I also called all local vets and the pound within 2 hours of his disappearance. 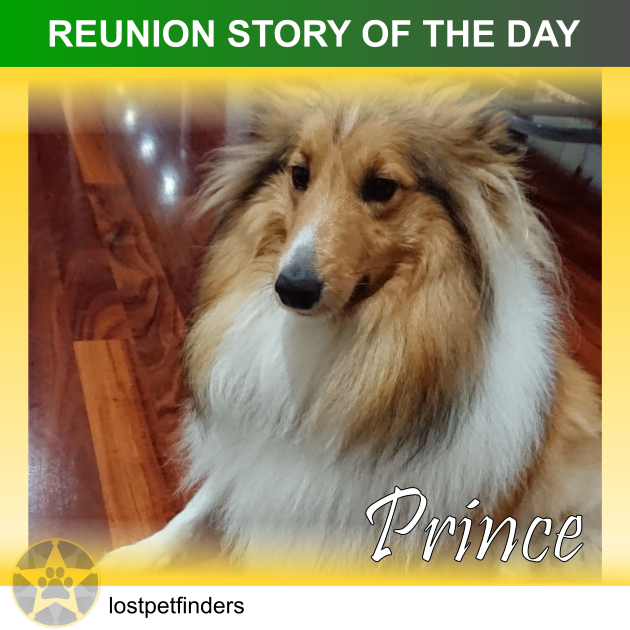 Then later that night I went on all social media platforms with a 'lost' ad, and felt encouraged by the words of support and climbing Facebook coverage, and sharing via 'Lost Pet Finders'. I also checked that Prince's microchip details were current, and informed the Registry that he was lost. I printed fliers and my friends posted information on their Facebook sites, and other lost animal sites. The following day I went to some petrol stations, stock food places and major shopping centres within a 20 km radius, with the fliers. I found it very encouraging with the positive responses I received. Within a few hours of driving and searching and distributing the fliers, I received a call from a boy who simply said 'I've found your dog'. The relief from those words was indescribable. I asked him to hold Prince and stay with him until I got there, as he was only a 1 minute drive away. Prince had exhausted himself from running and was laying down on the verge of his driveway next to his car. When I saw him I was overjoyed, and he had a look of recognition and relief on his face that I won't forget. It turns out that this kind boy had looked at the tag on Prince's collar and had called me from these details. I was so grateful that he had reunited us, and had also given Prince water to drink, and had stayed with him to ensure he didn't run away. It made me realise how kind and caring people can be, and I was so very grateful for this. I found the most difficult part of the process was to try to manage the grief and anguish I felt for Prince, and my thoughts about what could happen to him if I didn't find him soon enough. And the helpless feeling of just not knowing where he was or what was happening to him, and imagining the panic and anxiety he must be feeling. So, I tried to channel all of those sad feelings into absolute determination to do everything possible to find him, as I knew that this was what Prince was depending on. And I wanted to focus on finding him safe, and just bring him home. I thank everyone who was involved with this journey, and for their support and encouragement, and for helping to increase exposure to improve the chances of finding Prince. It is so lovely to feel that sense of compassion from others. My heart goes out to the pets and owners who are in the same predicament. Never give up hope, and be relentless in your searching efforts. 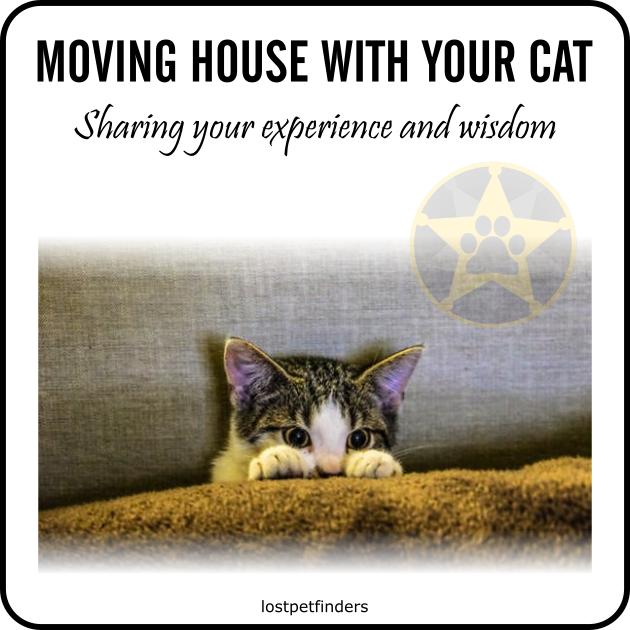 Although it seems impossible, try to redirect your grief into positive energy and strategies to find your pet as soon as possible.